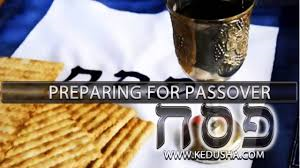 This evening the holiday of Passover begins. Jews and their families all over the world recount the Jewish origin story of fleeing oppression and finding freedom. The Torah tells us repeatedly that we must protect the stranger, the immigrant, in our midst because we know what it was to be a stranger in the land of Egypt. This narrative is the foundation of what makes working for justice for refugees and immigrants a Jewish cause. Rabbi Renee Bauer was featured as the Jewish voice in a podcast produced by the Carnegie Corporation of New York about this connection between religion and the current immigration issues. Listen here or see on Facebook for more thoughts to bring to your Passover table. 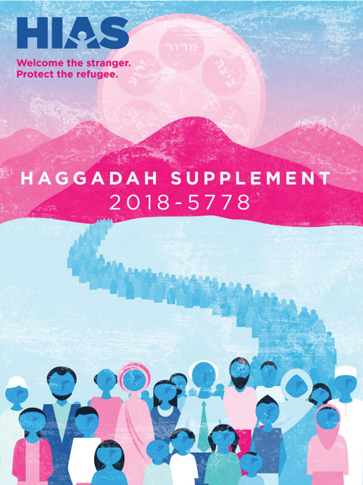 This Passover, during the largest refugee crisis in recorded history, let each of us take one action to support refugees and/or bring their stories into our seder. “And on all of the first seven days, Moshe used to set up the Mishkan and take it apart at the end of the day. On the eighth day, he set it up, and did not take it apart. And that eighth day was Shabbat, and it was the Rosh Chodesh of Nisan”. (Bamidbar Rabbah, Chapter 13) It was on this day that the Divine Presence began dwelling in the Mishkan. 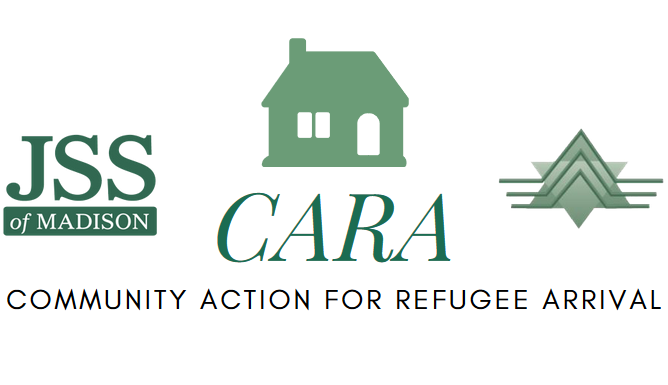 At JSS during this week of Rosh Chodesh Nisan we are also initiating a new program, Community Action for Refugee Arrival (CARA). Over the last nearly a year and a half since the initiation of JSS’s new refugee program, we have had dedicated volunteers who have prepared homes, meals and basic necessities for our newly arriving families. This is hard work that happens with little advanced notice. The CARA program, in which Congregations and community organizations volunteer to partner with our resettlement staff to do the pre-arrival work is a way for us to share the burdens and privileges of preparing for new families while harnessing the power of existing community organizations. Just like the mishkan that was taken apart each day for seven days and finally stabilized on the eighth, so too the pre-arrival work is being given a stronger structure with CARA. Last night we had a refugee family arrive from Afghanistan. Congregation Sha’arei Shamayim has worked hard over the last couple months to prepare a home, collect all the basic necessities and fundraise for this family. They made sure that an apartment was move-in ready for the family when they arrived after a long journey. We are so grateful to all the congregations which have volunteered to take on this task for future families. It is heartwarming to see the hard work, dedication and care that congregations in our community are undertaking to make sure that newly arriving families are welcomed and cared for when they arrive. I believe that when community comes together in this way the Divine presence will be in these mishkans, these sacred dwelling places. Right now Congress is considering funding levels for the rest of this fiscal year and next fiscal year that would expand the detention and deportations, further militarize border communities, and separate families. This comes after Congress failed to pass the Dream Act or another bipartisan solution that offers a pathway to citizenship for our dreamer community. Every dollar that is spent without enacting protective legislation will go toward detaining and deporting dreamers, TPS recipients, long time contributors to our communities, children, and asylum seekers, and dismantling family unity. It is critical that Senators and Representatives hear loudly and clearly that their constituents want them to cut this harmful spending, and instead enact legislation that protects our community members from deportations, family separation, and dangerous detention. Call Your Senators and Representatives TODAY: Click here to tell them to cut funding for detention, deportation, and border militarization! If you would like to be involved with the new CARA program, please reach out to our resettlement program at Becca@jssmadison.org. What does the month of Adar mean to us? This has been a week of difficult news with the tragic mass shooting at a High School in Florida and the failure of the Senate to pass a bill that would protect DACA recipients. On the Jewish calendar, however, today is Rosh Chodesh Adar, the first of the Jewish month of Adar, the month in which we celebrate the holiday of Purim. The Talmud teaches, “When the month of Adar enters, we increase in joy”. (Talmud, Ta’anit 29a) Adar is joyous and auspicious because the Jews escaped near annihilation at the hands of Haman in the Purim story. The are many joyous dates on the Jewish calendar but none other than Purim affect an entire month. There is plenty of challenging and disturbing news about immigration and refugees right now, which I could certainly focus on in this update. 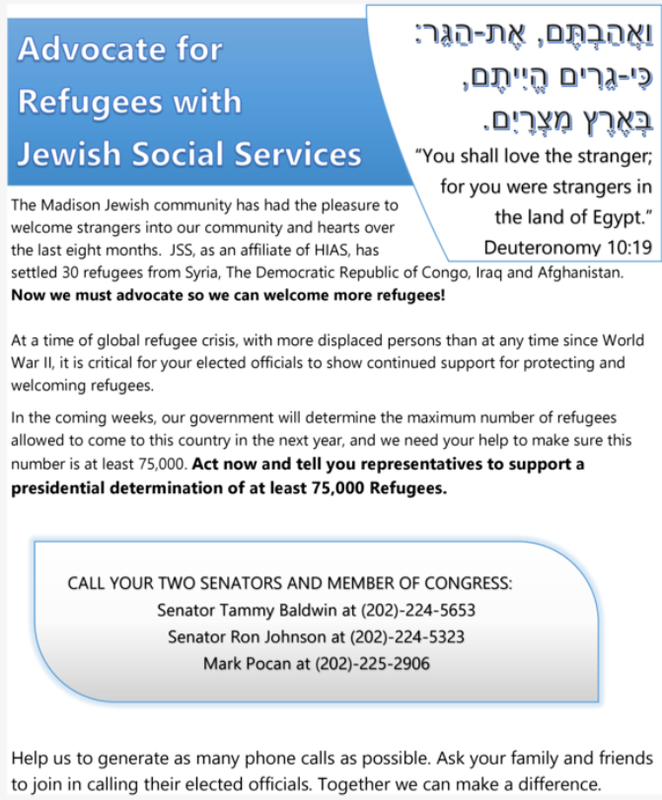 But in honor of Rosh Hodesh Adar I want to share bits of uplifting news about refugee resettlement this week. Since the last email update, President Trump’s latest refugee ban has expired, and the administration has begun resuming admissions from the 11 countries that had been affected by the last ban. There will be additional screening measures for people from these countries which will mostly likely mean slow and limited admissions from these countries. JSS has been matched and accepted an Iraqi Kurdish family for resettlement and is waiting for travel to be booked so we can welcome this family to our community. Iraq was one of the 11 countries that was part of the last ban so receiving news of an Iraqi arrival is certainly joyous. We have good news from one of the Syrian refugee families that I wrote about in my last e-mail, who has been a ‘stuck case’ (matched for resettlement with JSS but not granted travel). Our resettlement case worker has heard from this family who is in a refugee camp in Jordan. They have been asked to begin their health screening process again, which a positive sign that they may finally be moving toward being granted travel to Madison. We now must simply wait and hope that process continues to move forward. Our welcoming congregations program has begun in earnest. Congregation Sha’arei Shamayim is working hard to prepare for the next refugee family to arrive. Meanwhile, a few other communities are in the process of creating infrastructure to take on the pre-arrival tasks for families that will hopefully arrive in the spring. Seasoned JSS volunteers are an integral part of mentoring these communities as they learn the ropes of the resettlement process. It is heartwarming to see new and old volunteers working together to support the program. One of our most recent arrivals, a family from Afghanistan, just welcomed a new baby. The baby and mom are doing well and celebrating their growing family in their new home. Three Syrian families we welcomed in December and January of last year are applying for Green Cards now that they have passed their one-year anniversary in this country. May this joyous news be just the beginning. The Book of Esther teaches that about the month of Adar that “The month was reversed for them from grief to joy”. (Book of Esther, 9:22) So too may we continue to work together to reverse the tide for refugees and immigrants in our country. Even though the Senate voted down the immigration bill that would have protected dreamers we must continue to raise our voices in support of DACA recipients. It is critical that our national leaders find legislative solutions that reflect our commitment to family unity and offer a pathway to citizenship for as many dreamers as possible – without jeopardizing other immigrant populations. Our elected leaders also need to hear that their constituents urge them to oppose any proposal that would prevent family unification, deprive dreamers of an opportunity to pursue a pathway to citizenship, or increase the immigration detention, deportation, and border militarization machine. Learn more and call today! This Shabbat we will read Parashat Beshalach from the Book of Exodus in which the Israelites begin their journey out of Egypt, out of the land of slavery. At the end of last week’s Torah portion Pharoah finally agrees to let the Israelites go after the God sends the 10th plague, the plague of the slaying of the first-born sons. We read last week’s portion with a sense of a relief that freedom has finally been granted. But this week we learn that the escaping enslavement is a journey and does not happen with a simple decree. The complication begins when “Pharaoh and his servants had a change of heart toward the people, and they said, ‘What is this that we have done, that we have released Israel from serving us’ … and he chased after the children of Israel, as the children of Israel were marching out triumphantly” (Exodus 14:5-8). The Pharaoh and his officials chase after the Israelites. They catch up with them at the shores of the Red Sea. The Israelites are suddenly trapped. They are looking ahead at a Sea that they cannot cross with their oppressors rapidly approaching behind them. When we read these words this Shabbat we will be marking the one-year anniversary of President Trump’s signing of his original Refugee Travel Ban. As we read about the Israelites trapped at the Red Sea, I will think about the refugees who are trying to get into this country. Particularly I think about the two Syrian families who we were assigned to JSS and we agreed to resettle in late 2016 and early 2017. They are both young families with young children (ages 2 to 8) who have been in a refugee camp in Jordan since 2012 and 2013. They both went through the lengthy process of gaining refugee status and made it to the final stage of being assigned a host city (Madison) in the United States. Like the Israelites they had been given the decree that they were escaping to a new, safer home. They just were waiting for travel to be booked. The original travel ban combined the carefully planned bureaucratic slow-downs has meant these families continue to live in refugee camps. Their health and security clearances have now expired and so they must begin the process again and wait for the ban on Syrian refugees (and refugees from 10 other mostly majority-Muslim nations) to be lifted. They thought they were beginning their journey to freedom but now they are trapped. More immigrants are at the risk of being trapped if the administration’s goal of reducing or eliminating ‘chain migration’, as they call it, comes to fruition. Chain migration is really family reunification. The administration is launching an attack to stop U.S. citizens from sponsoring their parents and siblings, and stop green-card holders from sponsoring their children over 18 years of age. If the administration succeeds families will be on two separate sides of the ocean with no way to reunite. In the Torah’s narrative Moses, by the command of God, parts the Red Sea so that people can cross before their enemies reach them. They are saved and continue on their journey to freedom. We cannot depend on a miracle to free those who are waiting to come to escape war and to rejoin their families. We must make the miracle ourselves by speaking out against legislation that will be ban family reunification while continuing to show our opposition to the refugee ban. Click here to learn more ways to take action. On this one-year anniversary of the Travel Ban let us together part the seas to allow the shores of our country to be open to those seeking safety once again. 1. Learn more about Temporary Protected Status for Syrians and advocate to save it! 2. Oppose anti-family immigration policies and support a clean dream Act! The Trump administration is engaged in an aggressive attack on family-based visas, seeking to cut immigration to the U.S. by over 50%, stop U.S. citizens from sponsoring their parents and siblings, and stop greencard holders from sponsoring their children over 18 years of age. Using dreamers as bargaining chips, the White House is demanding that drastic cuts to family immigration and the diversity visa program be included in any deal to provide Deferred Action for Childhood Arrivals (DACA) recipients a path to permanent status and citizenship. Already, our immigration system is very narrow, only allowing U.S. citizens to sponsor their spouse, children, siblings, and parents, and only allowing greencard holders to sponsor their spouse and children. To deny individuals the ability to be reunited with their family members is to be anti-family and un-American. Call (202) 224-3121 and urge your Members of Congress to reject anti-family proposals and to pass a clean Dream Act now! Here’s a sample script: “My name is _________ and I’m a constituent of ____________. 1. Call Congress: Call 202-224-3121 to be connected to to your Members of Congress. 2. Amplify on Social Media: Tweet at your officials and use the hashtags #CleanDreamAct #ValueOurFamilies and #NoFamilyBan. Click here for sample tweets and Facebook posts. As the rabbi at Jewish Social Services I play many different roles including visiting homebound and ill members of the Jewish community. Last week, just days after our last refugee family had arrived in Madison I was visiting with a Jewish senior who had just moved into assisted living. As we sat together he shared with me part of his life story. He is a Holocaust survivor and had fled Poland and come the United States as a refugee. He told me about how Jewish Social Services in Pittsburgh had helped his family find an apartment and how the synagogue and the Jewish community helped his family build a new life after losing so much to the hands of the Nazis. After this visit I returned back to the JSS. As I walked to my office, I overheard our refugee caseworkers discussing how they were going to find appropriate apartments to rent for the next two families who will arrive on December 13. I smiled. It is a different decade, there are different wars being waged and the religions and nationalities of those arriving at the shores of the United States are different, but the work is same and the Jewish communal response is the same. We continue to help meet the basic needs of newly arriving refugees as they begin to rebuild their lives. In the coming days Jews all over the world will prepare for the upcoming holiday of Hanukkah. It is on Hanukkah that we celebrate the Maccabean triumph of religious freedom and we spend eight days increasing the light in our menorahs. Over the last months and weeks so many in our country and in the leadership of our country have cast doubt, fear and darkness over the plight of the millions of refugees. These refugees are seeking safety because they do not yet have the freedom we celebrate on Hanukkah. May the candles of Hanukkah shine brightly for justice and may we each take action that will illuminate global refugee crisis and counter the dark forces that are preventing so many in need from entering our country. Here is a suggestion of 8 actions you can take to support refugees on each night of Hanukkah https://www.hias.org/hanukkah2017. President Trump and his administration have engaged in systematic attacks against refugees, and we’re already seeing the painful human impact of these attacks. Trump’s historically low refugee cap, multiple refugee bans, and efforts to halt family reunification are hurting our families, our congregations, and our communities. Our capacity as a nation to welcome refugees is being threatened. Take action today and tell Congress to oppose the administration’s multiple refugee bans and all-time low cap on refugee admissions. After a pause for the Jewish holidays our refugee biweekly updates are back. A lot has happened with refugee resettlement since we last communicated. However, refugee news is no longer making the front-page headlines despite the fact that the Trump administration continues its effort to dismantle the refugee program and to ban Muslim immigrants from entering the country. This Shabbat we will read from Parashat Vayera which begins with Abraham and Sarah welcoming three strangers into their tent. They welcome them, give them a place to rest, water and a home-cooked meal. It turns out that the three men are messengers of God and tell Sarah, who is an old woman, will have a son in the coming year. Their prediction, a miracle, does come true. I think about this story in contrast to where we are as a country today. Locally, here in Madison and in communities around the country, people are responding to refugees like Abraham. They are running to greet them and respectfully providing for their basic needs as they set new homes and lives in this country. Meanwhile the federal government continues its attempts to block refugee entry into the country. Last week President Trump signed a new executive that generally bars 11 nationalities and stateless Palestinians for at least another 90 days. These eleven nationalities made up 44% of arrivals in the fiscal year from October 1, 2016- September, 30 2017, primarily from Iraq, Syria, Somalia and Iran. The percentage is likely an even higher of those who have been approved for arrival in 2018 and are waiting in the overseas pipeline. The countries are Egypt, Iran, Iraq, Libya, Mali, North Korea, Somalia, Sudan, South Sudan, Syria, Yemen, and stateless Palestinians. All of these countries except North Korea and South Sudan are Muslim-majority countries. The Administration’s announcement effectively dismantles the refugee resettlement program. These announcements will affect nearly every refugee waiting for resettlement. It also means that we will see very few refugee arrivals in the next few months and throughout the next year. We at JSS are awaiting advice from HIAS about what this will be for our community. Meanwhile we are brainstorming ways to keep our refugee resettlement program intact during this new 90 day period so we are ready to welcome refugees when they are allowed in. We are angered and frustrated that we have the resources, the community support and strong structures in place to welcome families but are not receiving any new families. Families in desperate situations who have been approved for resettlement in the United States are now being told that their dreams of a new safe and secure life are on hold. May the wisdom of this week’s Torah portion of welcoming the stranger with open arms lead us to work for more just policies in the weeks and months to come. Read more about the new Executive Order here. Speak out about the ban here. Our Torah portion this Shabbat begins saying, “You stand this day, all of you, before Adonai your God” (Deuteronomy 29:9). The Torah then goes on to explicate who ‘all of you’ are and it includes the ger the stranger. At this important moment of standing before God the stranger, who lives among the Israelites, is included as part of the community. On this last Shabbat before the Jewish New Year our tradition calls us to stand with the entire community, citizen and newcomer alike. However, we are living in a country in which the national discourse is increasingly anti-immigrant and our lawmakers are attempting to keep immigrants and refugees out and divide, rather than unite people. Since our last email to you the president has announced that he will end the DACA (Deferred Action for Childhood Arrivals) and the Supreme Court has reaffirmed that the travel ban on all refugees without close family members in the United States will remain in effect. JSS strongly opposes both of these actions and our work is directly affected. Because of the Supreme Court’s upholding of the travel ban, JSS has had no new refugee families arrive in the last 90 days and are not sure when any more will come. One Syrian family that we did resettle this winter left in the early summer to reunite with family living in Kentucky. After just one month in Kentucky they decided to move back to Madison, where they felt much more at home. They returned and brought their extended family with them. Therefore, we have two new families with 12 members (and one on the way) here in our community. Our community has become a home where refugees want to bring their family, a community that has the resources and desire to welcome new families seeking safety. It is infuriating and heartbreaking that admissions have been stopped by the government and we are not able to resettle more people during the worst global displacement crisis in history. We at JSS are doing all we can to assure that refugee program remains intact and that refugee admissions begin again soon. Last week, a group of JSS staff and volunteers (adults and teens,) along with World Relief Fox Valley, our resettlement partner in Oshkosh, met with Senator Ron Johnson’s regional director and legislative coordinator. We explained the details of resettlement work and urged the Senator to advocate to the president to set the ceiling on refugee admissions to at least 75,000. We also shared our concerns about ending the DACA program, offering to meet with the Senator to share stories about clients of our agencies who benefit from DACA. Later this month we will have similar meetings with Senator Tammy Baldwin and Representative Pocan’s offices. This Saturday evening Jews around the world will gather for selichot services during which we begin the communal recitation of the penitential prayers, asking for forgiveness both individually and communally for our misdeeds of the past year. As we take stock in our actions we must ask ourselves how we are making sure that all our community can stand together and how we are taking action to protecting those who are being targeted by the current administration. We have included easy ways to take action below. May this new year bring more justice to all who live in our community and all those who are seeking safety around the world. As the days begin to shorten and chilly mornings become more common our attention turns to the fall and to the upcoming Jewish High Holidays. At sundown on August 21 the High Holiday season officially began with the ushering in of the Jewish month of Elul. During this month that precedes Rosh Hashanah it is traditional to blow the shofar each day to wake us up to the important work of Teshuvah, of repentance and renewal, that this season demands. This year we hold refugees, those who have been resettled in Madison this year and those who are now barred from coming in our hearts and use the shofar to amplify their cries. Please enjoy and share this liturgical piece written in honor of refugees and in protest of the Presidential travel ban. This Shabbat we read parashat re’eh, in the people are told ‘see, I set before you today a blessing and a curse’. There is a grammatical inconsistency in this sentence is noteworthy. The word see is an imperative in the singular but ‘before you’ is in the plural. The classical rabbis believed that all such inconsistencies were there for a reason, to teach us a lesson. We can learn in this week during which we have seen in clear sight the deep hatred that still exists in our country and is gaining support in places of power, that we indeed must open our eyes and see. Each of us individually must awaken to the racism and hatred that is brewing in our country and collectively we must act against it. The racism and anti-Semitism on display in Charlottesville takes place in a political climate of increasing anti-Muslim and anti-immigrant rhetoric. All these forms of hate are part of a dangerous fear and intolerance of the ‘other’. In order to make our country a safe and welcoming place for everyone we must each open our eyes to what is happening and together decide to act for blessing instead of for curse. I invite you to take a small but essential act in assuring that our country remains one that is open and welcoming. Over the next six weeks President Trump, in consultation with Congress, will determine how many refugees will be allowed in during the next fiscal year. Please join me in calling on congress to insist that we welcome 75,000 refugees in the coming fiscal year. See the full flyer with directions on how to call here.